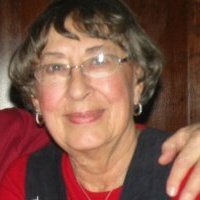 It is with great sadness that I share that we have lost our dear Gates cousin, Marilynn Weiss Marshall, who lived in Carmel, Indiana. She passed away July 20, 2016, at age 83. Marilynn was the grand daughter of Christina Barbara Gates, and Christina was sister to our great grandfather, John Charles Marcus Gates. That made Marilynn our "second cousin, once removed." Marilynn found me on Ancestry.com and shared with me all the research that she had done on our mutual Goetz (and Gotz) ancestors in Germany. Without Marilynn, we would have never known that our great grandfather had 4 siblings. We thought he had just one brother. And we would have never known that our Goetz ancestors were "feilenhauer"( filemakers) in Nuremburg, Germany. Marilynn gave us so much information we could have never imagined. Marilynn shared the heartbreaking letter that one of the Gates sons wrote to Marilynn's grandmother, Christina, explaining about the death of the first Gates grandchild, "Victor Eugene," son of Gertrude Gates and Albert Vogel. Marilynn and her sister shared many photos of the Goetz family in Germany, and in Indiana, and we had quite a time trying to figure out who they all were. She even had a photo of John Charles Marcus Gates, his wife Lizzie and their daughter, Gertrude, visiting Christophe Gates' (John Gates' father) grave in Germany. Thank you Marilynn for all your research and friendship. I hope we will go on to find more about our Gates ancestors in Germany, in honor of you. We will miss you! CARMEL — Marilynn C. Marshall, 83, of Carmel, passed away on July 20, 2016. She was born May 17, 1933, in Angola, Indiana to the late Carl and Lois (Wolfe) Weiss. Marilynn was a registered nurse and her career spanned many states including Colorado, Texas, Pennsylvania, and Indiana. In Indiana, she was the Director of Nurses for St. Vincent New Hope and later continued as a nurse for Community Hospital. Marilynn was a member of Carmel United Methodist Church for 40 years, participating in two medical missionary trips to Mexico and was a member of Stephen Ministries. In addition, Marilynn was a regent for the Daughters of the American Revolution. She is survived by her husband, Edwin W. Marshall; her three children, Christina (Joel) Larson, Donise (Scott) Gehrisch, and Robert (Guy O'Neill) Marshall; ten grandchildren; sister, Suzanne (Richard) Bottomley; and her brother, John C. (Elaine) Weiss. Visitation will be from 3-5 p.m. Monday at Carmel United Methodist Church at 621 S. Rangeline Road, with the memorial service immediately following. In honor of Marilynn's passion for medical mission work, memorial contributions can be made to Samaritan's Purse, to help supply countries in need of medical supplies. Friends and family are encouraged to leave condolences for Marilynn and her family at www.flannerbuchanan.com.